Feng shui principles can guide you in choosing and placing outdoor Buddha statues. 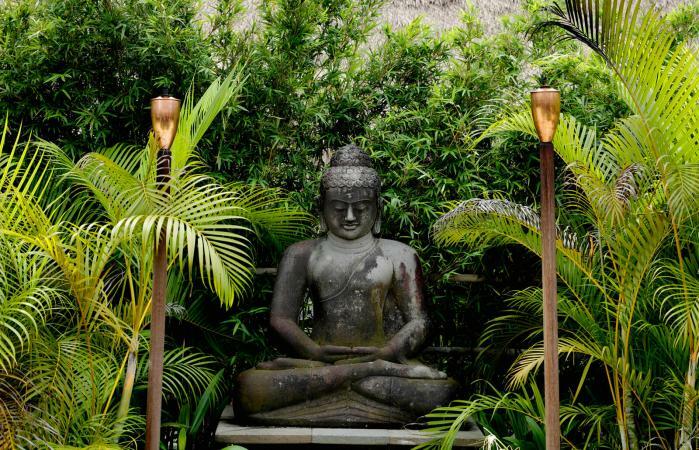 Most people opt for a garden placement, but there are other options, especially if you don't have a garden or you simply wish to display your outdoor Buddha statue in a different area. The most popular location for outdoor Buddha statues is the backyard garden. This area is usually private and is a great place to create a niche area just for the statue. Place the Buddha statue facing your house, preferably the back door to direct auspicious chi energy into your home. Following feng shui principles, you want your garden to be clutter free. A simple design approach may give you the best display choices for your Buddha statue. If you're a practicing Buddhist, you can always create a garden altar. It is easy to carve out a special nook just for a Buddha statue. You may already have a meditation area developed in your garden or you may be in the planning stages. The key focus should be one of peace and tranquility. You can achieve these through the plants you add to this area. You may decide to add a water feature. Something as simple as a bubbling fountain or a more elaborate koi pond design. Don't forget to add lotus flowers to your pond for an authentic Buddhist garden design. All of these garden designs lend themselves to the addition of an outdoor Buddha statue to watch over the pond or to welcome all entering the meditation sanctuary. You aren't limited to a backyard Buddha statute placement. Other outside areas can be enhanced by the addition of this deity statue. 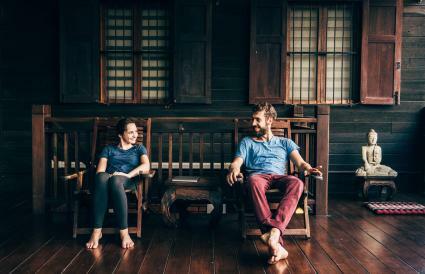 If your home features a front porch, you can place an outdoor Buddha statue on the porch. The statue can be placed facing the steps, so it greets family and guests upon their arrival. This placement bestows blessings and auspicious abundance. If you have a side yard, you can always place a statue here. The ideal is for the statue to face your home, preferably a door that leads inside. A front yard garden can become a resting place for a Buddha statue. You may position the statue, so it faces the front door. You may prefer to angle it so all who walk down the walkway are greeted by the Buddha. 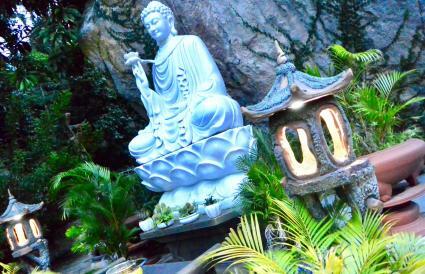 Feng Shui principles offer specific tips for correct Buddha statue placements outdoors. Make sure you follow these guidelines so you can avoid these taboos when it comes to placing a Buddha statue. Ground or Eye Level Placement? There are also rules that govern the placement of a Buddha statue to ensure it isn't disrespectful. A Buddha statue should never be placed directly on the ground. This is considered a very disrespectful placement. Set your Buddha statue in an elevated position, on top of a pedestal, shelf, large rock, platform, ledge, wall or table. It is also considered disrespectful to look down on a Buddha statue. The ideal height is at eye level or higher as the ultimate show of reverence and respect. You can add a Chinese pagoda lantern or two to light the area around your statue. This type of lantern is a popular choice for a Zen garden design to light winding pathways. Adding kinds of lighting is a well-known feng shui practice used to attract auspicious chi to an area. You want good chi energy to fill the area where you place your Buddha statue. This is especially true for a meditation or altar niche. Many people treat Buddha statues as ornamental decorations. In feng shui, the Buddha statue is respected and revered. There are certain placements you should avoid. Don't set the statue by the driveway or near a mailbox since these positions are trivial and mundane showing a lack of reverence and respect for what/who the statue represents. Don't choose a statue of just a Buddha head. This type of statue is considered highly offensive and disrespectful. Avoid placing a Buddha statue outside a garage, trash can/bin or near a utility area. A child's play area isn't an ideal location for a Buddha statue. Remember, this is a not a decoration, but a symbol of a religious figure and should be set in a place that is respectful of this. There are many choices of Buddha statue poses. Each has a specific meaning. Some represent a special stage during the Buddha's life. Others have symbolic meanings that easily translate to feng shui uses. Select the Buddha statue pose that resonates with your energy. You can also choose a specific material, such as wood, metal or ceramic as an element to use in the corresponding compass direction. Once you understand some rules for placing a Buddha statue, you can better assess your outside area for possible placements. As long as you keep in mind that a Buddha statue placement needs to be one of respect, honor and reverence, you will end up with an appropriate setting and placement.